Let’s Rain is a socially engaged public art project conceived with site and audience specific artistic practices aimed at involving of the communities through the activation of a relational device developed by the artistic collective Panem Et Circenses with the curation of Silvia Petronici and thanks to a training with the Maori shamans Erena Rangimarie Rere Omaki and Sam Manawa Anna Maria Sartori. We always start from the beginning. At the beginning there was a wood. It was a mixed forest, typical of the Apennine landscape of our areas, chestnut trees, poplars, oaks, downy oaks, acacias, some hornbeam. Inside the forest, under the trees, there was what is normal to think in a wood; under the trees, among other things, a pond, probably a pool of accumulation dug by the old peasants to water the beasts, as it was typical to do when the aqueduct was a city thing and up here the farms had to be self-sufficient for survival. It looks like the beginning of a fairy tale and maybe it will be. Inside the forest and under the trees there was a pond and there were mushrooms, many mushrooms, “good to eat” as the italian songwriter De Gregori used to sing and as our neighbor Costantino always tells us. He came to pick them up, he is a great connoisseur of mushrooms, he is a good person, we immediately became friends, he is the memory of this place. He was born here, he remembers everything, his grandfather was shot by the Nazis here, there is a memorial stone and every year in August he makes a Mass in memory of who was killed at Ca ‘di Bue, in one of the many massacre on mountain that are uncountable in our Apennines on the folding of the Gothic line. He was born up here and went to collect figs from the big tree that is located east of the house that was Ca ‘de Magnani and now is Ca’ Inua, the house of the “spirit of all things” (this means “inua” in inuit language), our home. The forest of Constantine mushrooms and of the pond that fed the beasts is gone and there are no more mushrooms and the pond has dried up. It is not the story of a great catastrophe, it is the image of a small piece of wood that was there and no longer exists, it is a trace, a sign, a slaughter of Nature, the smallness of small people, a drama which is great and universal because it embodies the widespread, so widespread dimension of our disconnection from Nature. Lorenzo and Tommaso, dear friends of us who have a house on the north side of the same mountain on which we live, tell us that they remember the noise of the chainsaw, incessant, for days and days, from morning to night. 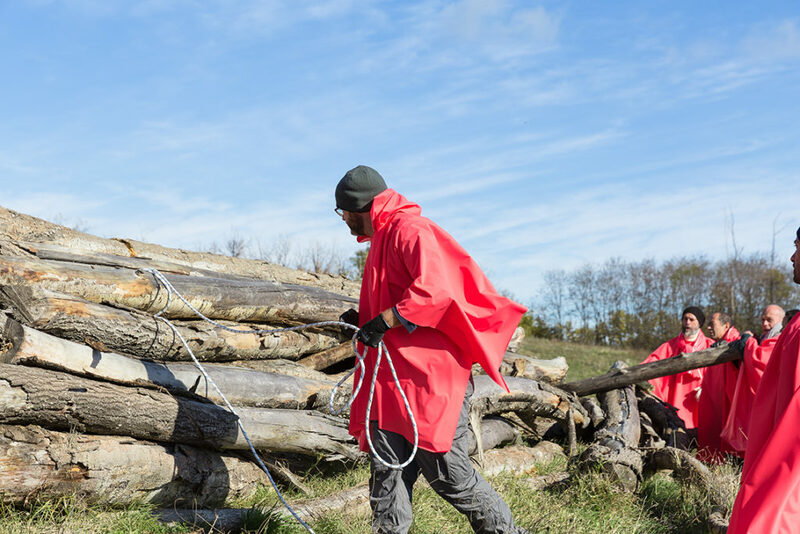 They remember exploratory walks to understand what it was all this cut, they remember piles and piles of wood “that you had to climb to go to the other side”. This story is recent, you do not have to go back many years. It was 2014 and the old property was entrusted to an agronomist because instead of that old unproductive wood they wanted to plant a beautiful chestnut grove, the “marroni of Montesevero” you can find them 12 euros per kilo in the city center of Bologna. “The first cultivation operation to be carried out is the clean cut of all the different species from the chestnut present in the plot, then the removal of all the stumps of the aforementioned species and the relative movement of land to fill the holes left by the grubbing up of the stumps. In the same way we proceed with the irrecoverable chestnut trees for which we make satin cuts and the removal of the stumps “(from the agronomist’s report). The first crop operation is to ELIMINATE the trees because “the chestnut grove is in highly naturalized conditions, in a very advanced stage of renaturalization” and this is bad. Finally, along with poplars, oaks, downy oaks, acacias and some hornbeam, in the end also the chestnut trees have gone down, nothing is left standing, the chainsaw sang for weeks, the stacks are accumulated, the forest has disappeared. Meanwhile, the old property has been forced to sell and we have collected, together with the wonder of this place also this sad and wicked legacy. We were dismayed the first time we saw and understood what had happened, we were dismayed when Costantino told us, we were dismayed when Lorenzo and Tommaso described it. We were dismayed, then we became sad, then we got angry, then came Erena that during the seminar “Water that nourishes” has entrusted us with a task. She asked us as artists (who as such have a responsibility towards the world and society) to think about an artwork that emerged from the seminar experience. “Water that nourishes” was born from an help request for the dramatic situation of drought Italy experienced last summer; water nourishes, water is life; life, us, we are water. All the energy that was in our anger has undergone a process of transformation, has maintained its intensity but has become something else: first it has become desire and then, pushed to action, it has become Let’s Rain. Let’s Rain is an aesthetic socially engaged action. A public art project born from a very special experience shared by the artists of the collective Panem Et Circenses and by myself with two Maori women of medicine, Erena Rangimarie Rere Omaki and Sam Manawa Anna Maria Sartori. The activation of the whole project was, in fact, a seminar in which, with the guidance of the two shamans, a group of twenty people, operating in contact with the Earth in the most diverse ways, made it rain. Literally and also symbolically. Rain lacks not only in its physical substance, as a meteorological phenomenon, but its value is lacking in people’s consciousness. It is lacking in their life, in everyday gestures and in the visions of the future. Climate changes and water scarcity at our latitudes invite us to look for solutions to develop better resilience. 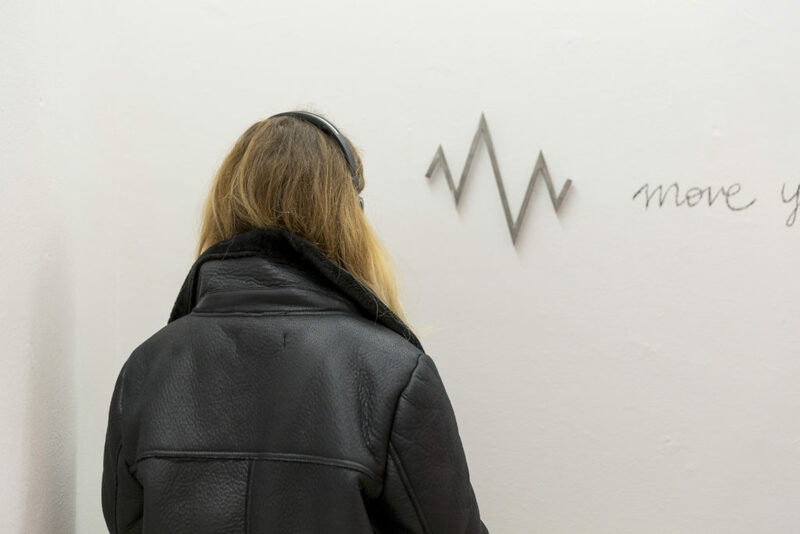 Art, in particular in its declination of public site and audience specific art, can be an instrument of this research and it can be, above all, because it opens to collective dynamics and because it bases its practice on respect, observation and listening. In this sense, art, so conceived and practiced, very closely resembles shamanic practice and its foundation on the experience of the connection of the whole living and of the intrinsic link with the vital environment. The rain synthesizes, even on a symbolic level, the contact between sky and earth, shows clearly the existence of a continuous connection between all that exists and that, as it is connected, reproduces, changes and evolves. The progressive disconnection due to the scarcity of rain is a danger: on the material level, certainly, because it can generate a consequent scarcity of food, but also on the symbolic and spiritual level because it can generate a loss of the link with everything around us, with the mother earth, with the elements of which it is composed and which are what we ourselves are. Let’s Rain. In italian we can translate this expression in two different ways that are both conceived in the project: let it rain and create the conditions for the rain to come. Existential conditions based on the choices and gestures of our lives but also cultural conditions in the collective consciousness of the communities that inhabit the earth. It is a project that is to be considered in that part of the socially engaged sphere of those participation practices included in a site-specific approach to public art. 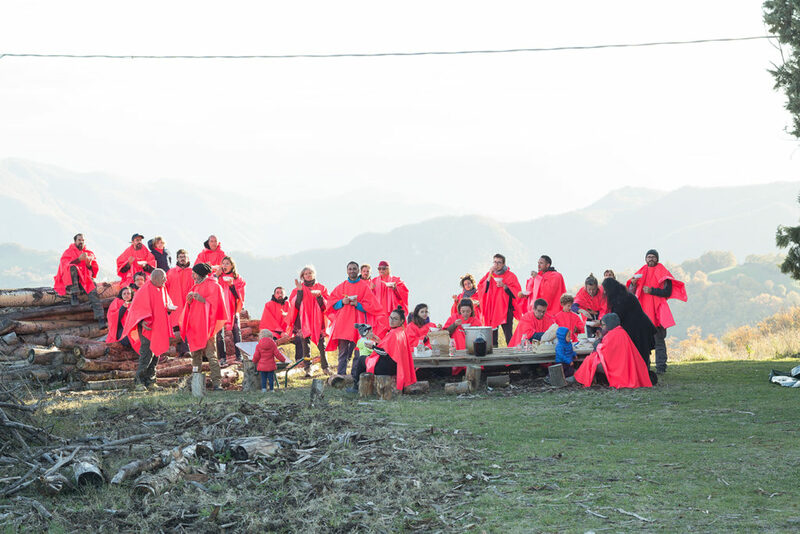 It is a collective action that involves a community of participants in a path of gestures and goals to be achieved but also and above all in a path of awareness, of observing one’s own way of entering into the elements of nature, of feeling part of it. A path of change from inside to outside. This year the International Biennial of Art of Venice has made us participate in a reflection on these issues. The exhibition curated by Christine Macel, Viva Arte Viva, in particular in the exhibition at the Arsenale, took stock of the practices of participation in contemporary art, the powerful interest in nature and the sense of community connected to it that moves many socially engaged jobs as well as the need to poetically elaborate a widespread, everyday and transcultural sense of the sacred. In this regard, art and shamanism live in a common space from which the artists together with the shamans of the most various traditions, elaborate aesthetic devices that touch the heart, move the minds, steps and actions to the care of oneself and the earth, to the reconnection and to empathic contact. A shaman Huichol collaborates with Anna Halprin to realize his mighty Planetary Dance; Ernesto Neto works with the spiritual leaders of the Amazon Indians Huni Kuin; Ayrson Heràclito documents the Sacudimento, a spiritual practice to purify houses from the spirits of the dead; Marcos Ávila Forero reconstructs with the Afro-Colombian community that lives along the banks of the river Atrato, the lost practice of striking the river water to communicate. This is the point. To learn, or perhaps to remember, the connection between the under and the above, the inside and the outside, between what is not seen, that remains hidden from view and what is manifest. How do you call the rain? We asked all of them with more or less irony. Yet in the end it rained and snowed a lot. We are made for the most part of water and the question in this work is first and foremost the awareness of a connection that is based on being made of the same substance, on being together part of the same living organism that lives in us and that we live in , which proceeds with us, step by step, in the life of the planet. The water inside us calls the water out and it rains because it returns to be clear. The unkind nature finally gives way to mother nature. The magnificent and progressive lots, described by the great italian poet Leopardi, of a ruthless and disconnected Promethean individualism and of a society founded on the market, on the unconditional exploitation of resources, the property and the feeling of being superior to the beings of nature, in the new post-industrial millennium, are dust scatters with the wind that brings rain on the mother earth. The space opens up for a new approach to the environment and nature on which we can base new practices of understanding and relationship. Nature, a living organism, includes us as one of its parts connected in a dense network of interdependences, exchanges, alliances. Acting in the overall environment of this living organism means producing other actions, movements, reactions. It means affecting the balance of the system. This work moves a sense of responsibility full of hope, a constructive attitude that believes and realizes change. The main device that activates the relationship within the artwork is undoubtedly the totem. Peoples of the earth have always erected totems, as one of the participants in the collective action said, astonished and moved by carried out the same gesture of millions of people in every part of the world and of time. By studying the ancient traditions of ritual poles in different cultures, the artists immediately encountered the totem poles of Native Americans. The word totem derives from the term “ototeman” which in the language of the Ojibwa, a native population of the Great Lakes region of North America, means “he is of my kinship”. It is therefore an element whose reason is primarily identity, aggregating and social in terms of a culture that bases the sense of community on the parental bond, between men and between them and nature. 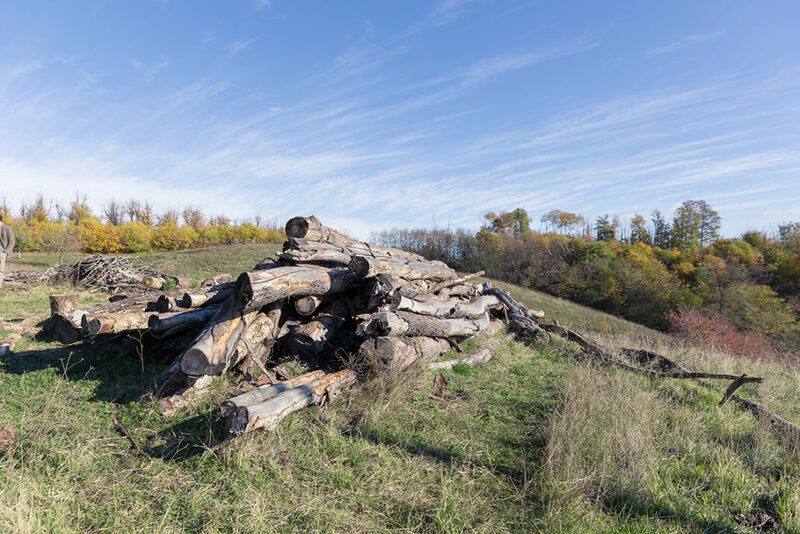 A trunk of poplar was chosen, found in the pile of trees brutally cut and never recovered from the previous owners of the farm. A choice guided by the reasons of the artwork originated from the artists’ need to heal the wounds and to take care of that place, Ca’ Inua, of which they have recently become custodians. Populus, the Latin name of the poplar and at the same time of the people, seemed particularly evocative to the artists given the desire to activate a participant community of the work and, more generally, to act symbolically on responsibility and shared action. The totem is an object involved in a mystical vision of the relationship with the elements, at the center of ritual and tribal practices. So the tree is a totem because its behavior and its function in the overall equilibrium cultural ecosystems, guarantees the symbolic connection between the sky and the earth but it is also because, on the biological level, has a fundamental role in the production of rain ensuring the necessary microclimate. The choice of the totem therefore had more levels of consistency with the fundamental assumption of the artistic project Let’s Rain. 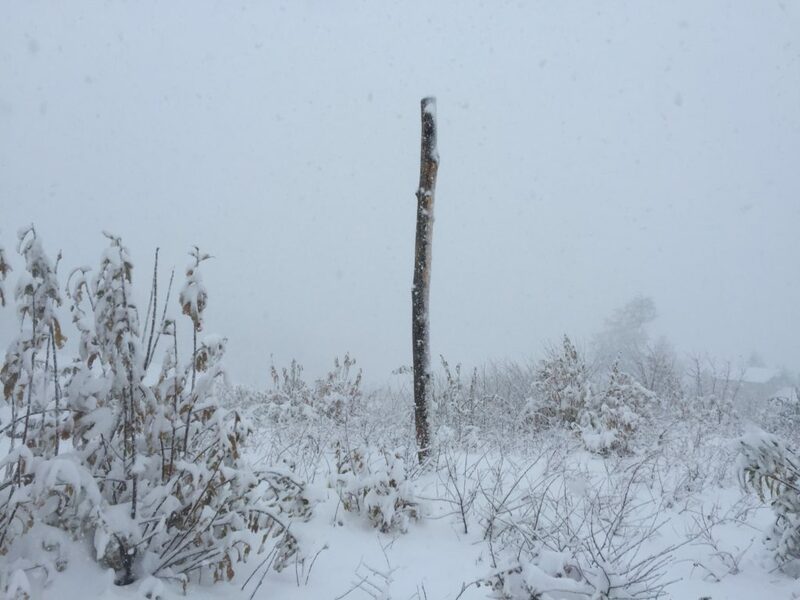 The totem needed an intervention, a sign, that would synthesize its dimension of collective gesture to call the rain, symbolic place, antenna, witness. It was a matter of finding a symbol that condensed the intention, the experience and the reasons of the community created by the work during the collective action: an image of this experience, able to keep it active, providing the totem with the necessary charge for it to operate. The symbol, as an excellent synthetic element of the work, could not derive, in its turn, from a participatory designing process, which at the end of the collective action, allowed a collection of participants’ impressions on the experience just concluded. Words, images, concepts, reflections, emotions and stories were collected by the artists that took the shape of the symbol in an immediately following elaboration. 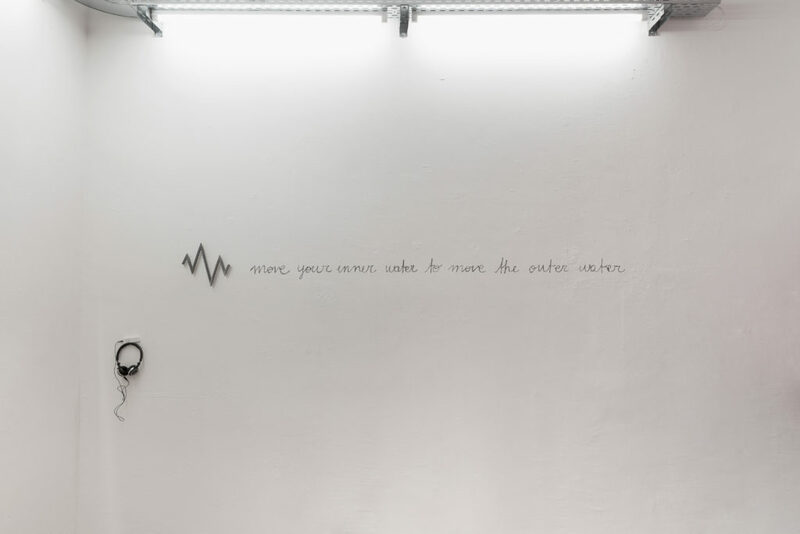 At the end of an articulated path, even before the graphic elaboration, it emerged, thanks to an “emotional interpretation” (as the artists define it) of all the collected contents, a phrase that gathered the sense of what everyone shared, “MOVE YOUR INNER WATER “, to which, secondly, a second sentence” TO MOVE THE OUTER WATER “was added to complete the first one. The first and the last word of the two sentences, “Move” and “Water” – in turn, the meaning of the whole work – have composed the “MW” monogram with the two initial letters. The letters evoked other words and other associations, Mother Water, Man and Woman, Mountain and Wind, Music and Wave being, moreover, two mirror signs, the one the perfect double overturned of the other. Entering the graphic design phase of the monogram, the form literally emerged from many failed attempts. This symbol immediately showed its autonomy, a sort of previous will set in an astonishing sequence of coincidences. And, on closer inspection, even a wave. A sound wave, the one that, as Schumann describes in its resonance model, envelops the Earth. The Schumann resonance, produced by a very low frequency vibration, about 7.83 Hz, is known as “the breath of the Earth”, derived from the interaction of the Earth’s surface with the ionosphere. This interaction creates a constantly vibrating electromagnetic structure thanks to the electric activity produced by lightning. And the symbol, in fact, has an aspect very similar to the elementary stylization of a lightning, light in the sky lit by the humidity conditions of the clouds: the trigger, one of the rules of the rain, together with the presence of the trees, responsible, in turn , of the humidity that accumulates in the clouds. 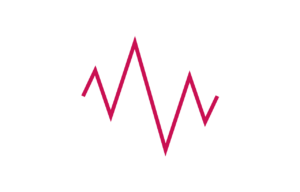 Concerning the main relationship on which the whole work is involved, the one between inside and outside, the frequency of Schumann resonance is the same as the electromagnetic waves produced by the electrical activity of the nervous tissue in the central nervous system: the brain waves coming from from the activity of the limbic system, in particular the alpha and theta waves, implicated, the first ones, in deep relaxation and the second ones, in the fleeting state of transition between wakefulness and sleep. In this special state, defined as hypnagogic, images, sounds and voices are associated with hypnotic trance states, extrasensory perceptions and, in general, greater proximity to unconscious and normally inaccessible contents. Freeing the mind from the conscious thought that in our culture is inevitably oriented by conceptual schemes of logic-deductive base we open to resonance with everything that surrounds us. It is a mystical and profound opening. This is what this work hopes to achieve in a path of increasing listening, contact and intimacy. The inside and the outside literally come into resonance. The rain inside and the rain outside, the deep water that moves the clouds. and sacrifice is born of action. 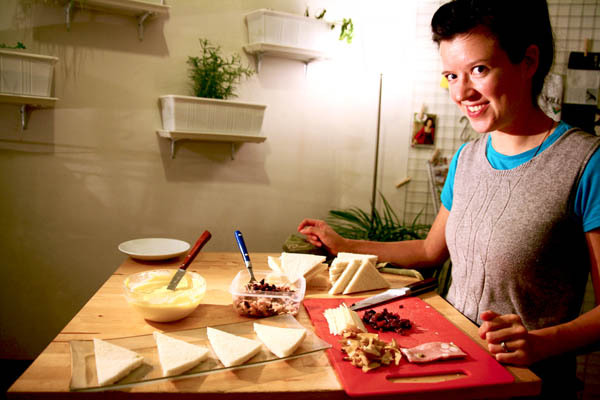 Panem Et Circenses bases its research on the relational dimension of food. A punctual and constant dimension on the semantics of food, the behaviors and the feelings associated with it. 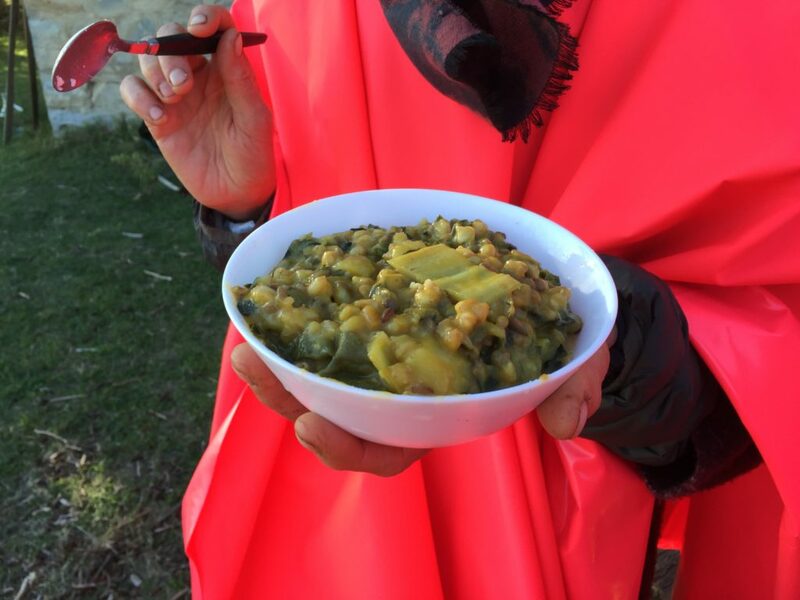 The collective has been investigating these aspects of food for years starting from an analysis of its derivative and linguistically stratified form of cultural construct and for this subject, in our culture, to a progressive estrangement from its material and symbolic origins in the earth. 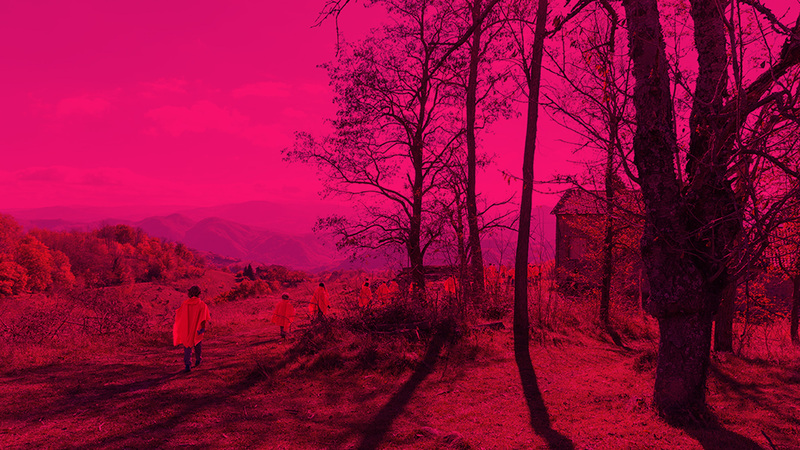 Let’s Rain desires to make explicit the link between drought and food scarcity, opening space, with a process of relational and participated artistic practices, to the theme of responsibility and the consequent one of action for change. Eating together the products of the earth where we were during the collective action as drinking water during the interaction with the installation meant for the artists to seize the opportunity to associate shared values ​​and intentions to a conscious experience of contact with the earth , with the surrounding environment from which it derives and of which food is made. Let’s Rain intends to continue as a cycle of residencies in various international locations in direct contact with local communities, artists and institutions interested in issues of environmental sustainability, water and the ecosintonic relationship between us and the environment. Let’s Rain will develop, therefore, as a traveling project in different locations in Europe and beyond until arriving in New Zealand by closing the open circle with the Maori, natives of New Zealand, thanks to the arrival of the two shamans for the seminar at Ca ‘Inua , home of Let’s Rain’s first collective action. Participated artwork consisting of a collective action and a site-specific installation. 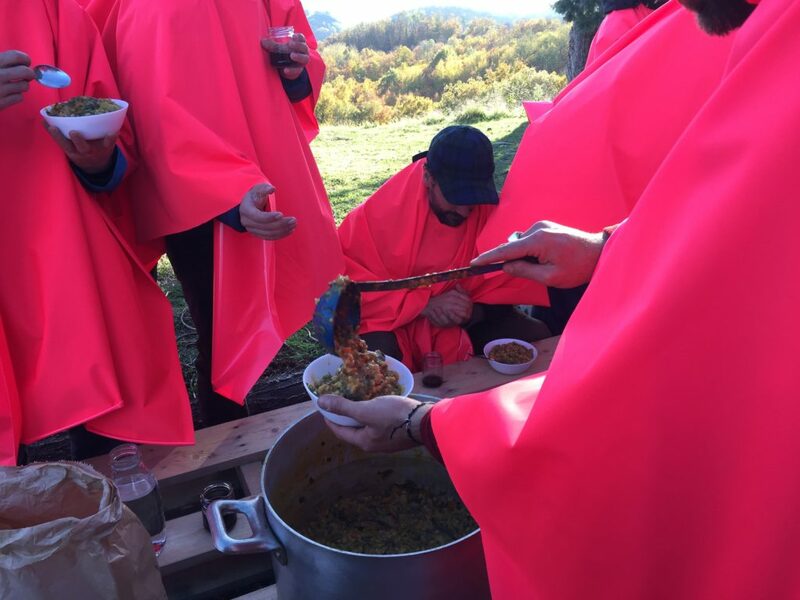 The collective action was carried out on Sunday 12 November at Ca ‘Inua, in the Marzabotto area on the Bolognese Apennines, from 10.00 am to 6.00 pm, in the presence of forty participants. The installation is realized and presented on December 15th in Bologna in the research and experimentation space directed by Panem Et Circenses, the Center of Contemporary Art on Food Culture, the CACCA in Via Solferino, 33/a. 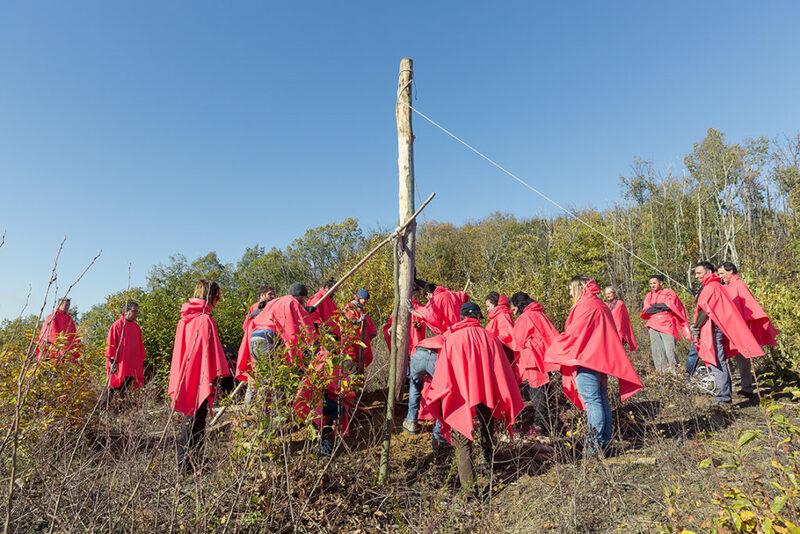 During the action a poplar trunk was erected, deprived of the branches and roots, in the form of an 8 meters high totem, placed in a 2 meters deep hole previously excavated by hand. 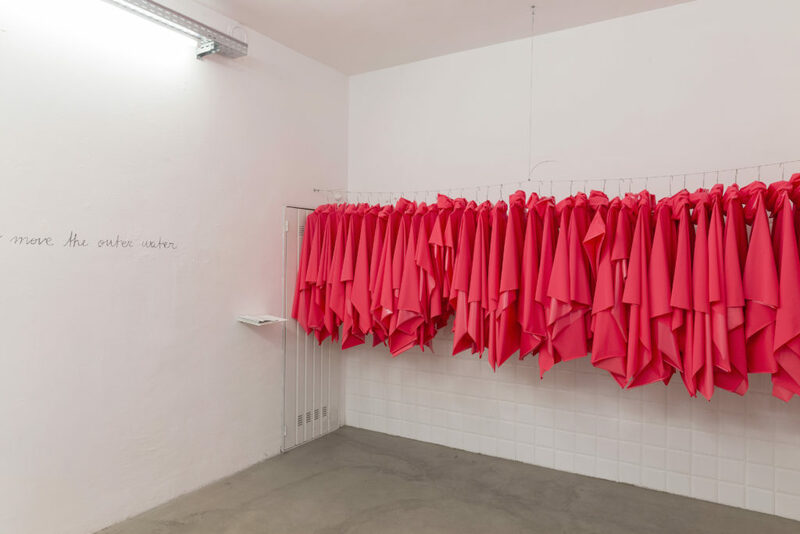 The capes and hoods made by the artists in waterproof red material were worn by the participants. 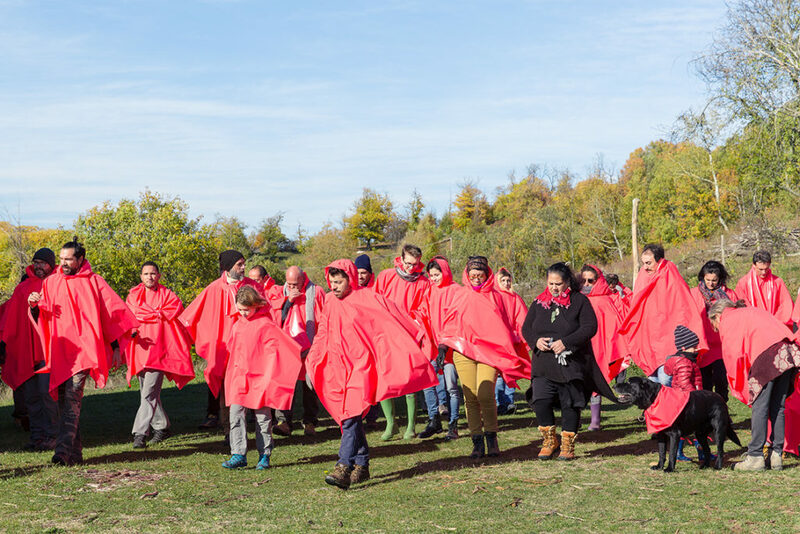 Sam Manawa – one of the two Maori shamans with whom the seminar from which the Let’s Rain project began was realized – was present at the action; She performed a traditional song, “Karanga” which in Maori language means literally “call”, with which work was opened in the morning. A vegetarian meal based on vegetables, bread, cheese and honey from local producers was consumed and, finally, impressions and suggestions were collected for the creation of a symbol to be affixed to the totem. The collective action took place with the participation of many people who have been involved by the artists through a participation device made specifically for each one: a personal invitation sent to everyone individually (through ordinary mail, e-mail, information branched out from social networks and by hand) containing a small hand-written text for each guest and a text, the same for everyone, of motivations that introduces the image and the reasons for the action with an image, a piece of wood with a cloud shape , which summarizes the link between the trees (the totem) and the rain. In the days that have followed the action, the artists have given way to the elaboration, starting from the elements provided by sharing the experience with the participants, of a symbol to be affixed to the already erected totem. From this process of reflection and reworking emerged a form that contains the impressions of everyone: it is a sound wave, a bridge, a mountain, there are the initials of Mother and Water, the symbol of rain and fire, the balance and alternation, it is a flash, an above and below, an inside and an outside, a relationship and a way, a call and a trace. 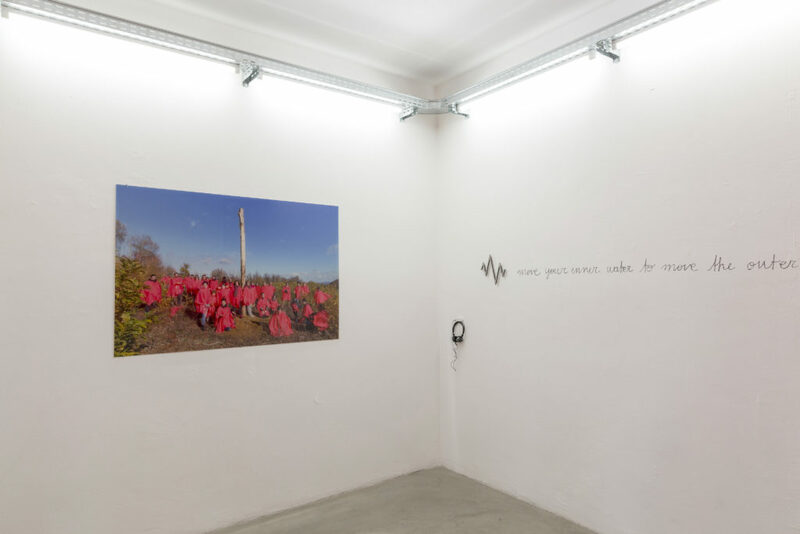 The installation has both a narrative and a poetic function. It speaks, on the one hand, of the experience of collective action and, on the other, of its meaning. The elements – which make up an overall environment – come from the action and are elaborated a posteriori in order to understand its meaning and share it. Sharing is a central theme at the base of the project which, right from the title, is a participatory work, a collective aesthetic practice. Let’s Rain is, in itself, an accomplished statement. We wanted to make it rain and we wanted to do it together with a community of participants who shared with us the values ​​and practices that animate this work. We have chosen to engage the language of art to spread awareness on environmental issues, in particular on the theme of water as a fundamental vehicle of life, an element of connection and regeneration. We wanted to induce a new experience of the rain, starting from the awareness of the intrinsic bond (spiritual and symbolic) and the extrinsic bond (in daily behavior and choices) that binds us to it, to its scarcity or abundance, to its permitting and changing the quality of our life on earth. Today, when I look at the sky above the top of the trees, I look for clouds. My perception has changed as the convictions that animate it. I hope it rains. Even my heart has changed. Call the rain and do not seek shelter. Let’s Rain is a socially engaged public art project conceived with site and audience specific artistic practices that aims to the involvement of the communities through the activation of a relational device developed by the artistic collective Panem Et Circenses with the curation of Silvia Petronici and thanks to a training with the maori shamans Erena Rangimarie Rere Omaki and Sam Manawa Anna Maria Sartori. Let’s Rain originated from the seminar “Water that nourishes” held by Erena Rangimarie Rere Omaki and Sam Manawa Anna Maria Sartori at Ca ‘Inua in the town of Marzabotto (BO) during the first three days of September 2017. Let’s Rain (Ca ‘Inua, Marzabotto (BO), 12 November 2017 and Center for Contemporary Art on Food Culture, Bologna, 15 December 2017 – 20 January 2018) is a project realized thanks to the contribution of Donatella Zarotti and L’Isola D’Oro Ltd. The virtuous commissioning of a Fine Art print of the symbolic image of the project enabled the financing of production costs. We sincerely thank the participants in the collective action: Silvia, Anna, Virginia, Giovanna, Gea, Benedetta, David, Lothar, Alessandro, Matteo, Lorenzo, Michele, Stefano, Marco, Elisabetta, Matteo, Gauri, Barbara, Ilenia, Marco, Lorenzo, Angela, Sky, Thomas, Giammarco, Andrea, Francesco, Simone, Rachele, Lorenzo, Maria Elena, Mattia, Francesca, Mikis, Guido, Anna. 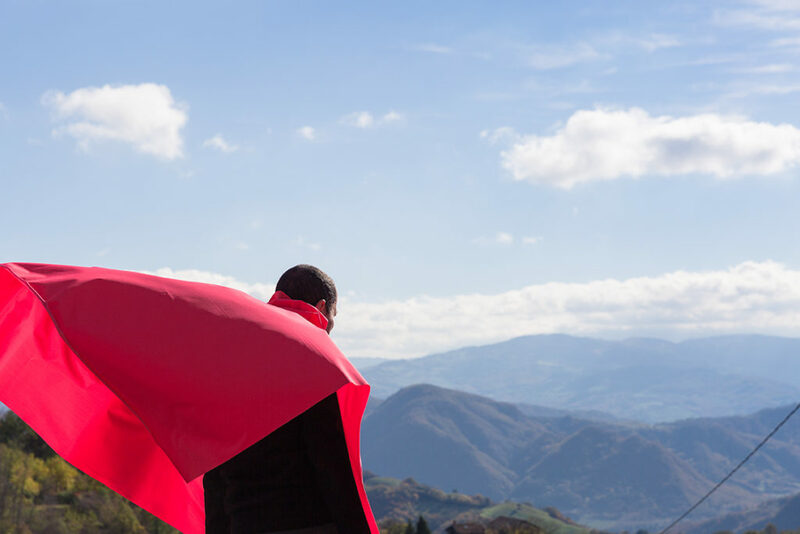 A special thanks to Erena who inspired this work, Sam Manwa who guided us and became our instrument of action, Gigi for the materials of the capes, Giovanna for the soup, Alessia De Ninno for the video footage of the interview with Erena. Princess Erena Rangimarie Rere Omaki Rhose, Doctor of Traditional Medicine Maori, Professor of Ecosophy at the University of Karlstad in Sweden and Ambassador of Earth Rights, has been involved in many countries around the world for raising people’s awareness, through conferences and seminars , on the value and the sacredness of water and on the reconnection with Mother Earth. It is also due to his work the extraordinary recognition by the New Zealand Government of the personal status of the Whanganui River with which Erena has close family ties. Daughter of the Ngati Kahungunu tribal chief (Hawk tribe), she belongs to the Maori family of the Waikato tribe, of which she is also a woman of medicine. Her name was given to her by the elders and means: Balancing, Peace, Flight through the Light. As the first and only woman in the family, she was entrusted to the elderly, who supported her in the development of her talents and rooted in the ancient tradition whose origins date back to the “time of memory”. To strengthen the deep connection with Mother Earth at the age of seven, under the guidance of his great-uncle Korobush, he spent three nights and three days buried underground. At the age of nine he returned to his parents and continued his education on the ceremonies, knowledge and secrets passed down from generation to generation. The Maori people are a warrior people whose culture is based on love and peace, the most important knowledge that Erena shares is the connection with Mother Earth, Love, Peace, Healing and Spirituality. She has been invited around the world to speak at various conferences on the concept of the Earth, Mother Earth, and has been a guest of many spiritual leaders such as the Dalai Lama of Tibet, Amrita Nanda May-India, David Swallow of the Lakota Nation, Pope Elie Hien Shaman of Burkina Faso, Nardia Steppenova shaman of Mongolia. Sam Manawa born in New Zealand, belongs to the Tainui – Waikato and Aotea – Taranaki tribe. He lives and works in Italy. Sam Manawa, unites the two roots of his Maori and Italian origins. Manawa in the Maori language means heart, place of affections. The word is composed of “Mana” which refers to the spiritual power of each of us and “Wa” which means defined space and time. Maintaining contact with her Whakapapa (genealogy) she deepened her culture by studying with Erena Rangimarie Rere Omaki her cousin, through travels and seminars for 17 years. She specialized in the work of the body through massage. With Atarangi Muru in New Zealand he deepened his knowledge of the two main methods of Maori Healing, Miri-Miri and Romi-Romi. Practice various types of massages and ceremonies for the person. She brings the elements linked to the land of belonging: water and fire, united with peace and resistance.